Can’t imagine why they cancelled this one. It was so much fun! SO HAPPY! Now BBCAM can run even MORE reruns of ancient Star Trek episodes that we have all seen 50X already. Are you guys serious? DIRK was the first original, witty, weird prime time TV offering in a long time, and you can’t support a little gem for 250,000 faithful fans! Sad, guys, just really weak, and unimaginative, and sad. We loved the show it the funniest and most enjoyable series of the year. We are disappointed that the next season was cancelled. Loved it. Totally bummed it is done. Enjoyed the twists turns ups and downs. Would like very much for there to be a season 3. Clever shows will never succeed… This was so much fun… Oh, I wish, at least, they make a proper finale… Too many open question left. This is SO disappointing! I just discovered this show and now its cancelled. =( I love it, it’s so quirky and different. Hopefully Netflix (or someone) will pick it up. *fingers crossed* Shame on you BBC! I’m so disappointed. It was one of the most original shows on television. It was filled with interesting characters, suspense, and fun. 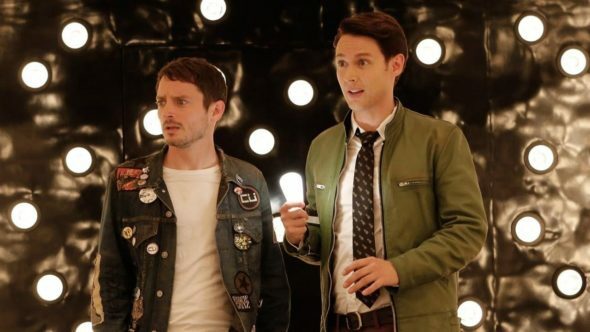 I’m sick of predictable formula television and despise “reality tv,” so Dirk Gently was one of a handful of shows that I regularly watched. Enjoyed this quirky, funny and sometimes just stupid show. You had to watch the next episode just to see how everything comes together but led you to the next episode. The show was a family favorite and help fell the void of no Doctor Who. We all love Dirk Gently. We are very sorry to see it go.